Although most people think the American Revolution ended with the British surrender at Yorktown, Virginia, on October 19, 1781, it did not. The war continued around the world, from the Arctic to Arkansas, from India and Ceylon to Schenectady and South America. Spain, which France had lured into the war, insisted there would be no peace without seizing British-held Gibraltar. Loyalists and Native Americans continued joint operations against land-hungry settlers from New York to the Mississippi Valley. African American slaves sought freedom with the British. In April 1782, Britain seized the initiative again with a decisive naval victory in the Caribbean against the Comte de Grasse, the French hero of Yorktown. 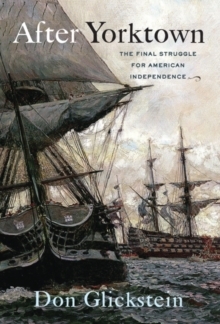 In After Yorktown: The Final Struggle for American Independence,Don Glickstein tells the engrossing story of this uncertain and violent time, from the remarkable American and French success in Virginia to the conclusion of the fighting-in India-and then to the last British soldiers leaving New York City more than two years after Yorktown.Based on an extraordinary range of primary sources, the story encompasses a fascinating cast of characters: a French captain who destroyed a British trading post but left supplies for Indians to help them through a harsh winter, an American Loyalist who released a captured Spanish woman in hopes that his act of kindness would result in a prisoner exchange, a Native American leader caught "between two hells" of a fickle ally and a greedy enemy, and the only general to surrender to both George Washington and Napoleon Bonaparte.